Android 8.0 Oreo rolled out to the unlocked Moto Z in May. 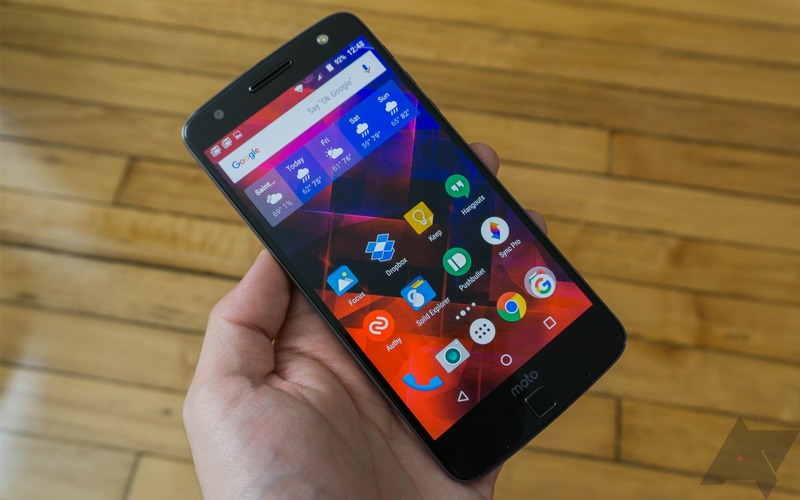 Now, the Verizon "Droid Editions" of both the Moto Z and Moto Z Force are getting the update. It comes with all the expected Oreo goodies — picture-in-picture support, notification improvements, and the like. LineageOS is the most popular custom ROM by far, and the project continues to update more devices to version 15.1 (based on Android 8.1 Oreo). Last time we covered LineageOS, the OnePlus 2, Pixel C, and Nexus 6 received Oreo. Since then, several more devices have been updated, including Google's flagship phone from 2012. Motorola hasn't been doing well lately. 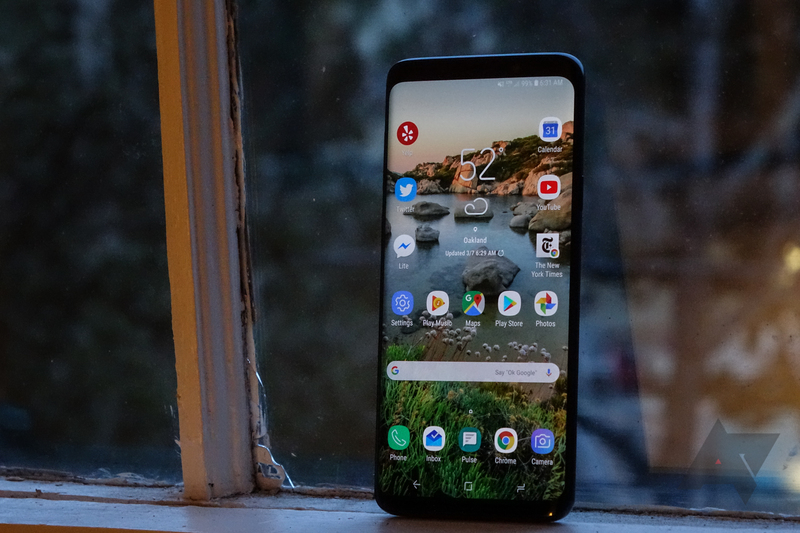 Several planned phones have seemingly been delayed or cancelled, and half of the company's engineering team in Chicago was laid off earlier this month. While Oreo has yet to be released for the company's 2016 flagship (at least beyond carrier testing), developers can now download the updated kernel source code. Lenovo-owned Motorola might have been onto something with its modular phone accessories for the Moto Z series, but a combination of slow development of compelling products and poor availability leaves them in a precarious position. Nevertheless, the company is pushing on with the project in 2018 and has some new Moto Mods coming soon, plus a new design competition. Projector phones always seemed like an idea that made more sense in science fiction than in present reality, which is probably why the Galaxy Beam failed to gain much traction. Such as it is, the benefit of the Moto Mod design allows anyone with a compatible phone to add on a countless number of peculiar peripherals... one at a time. 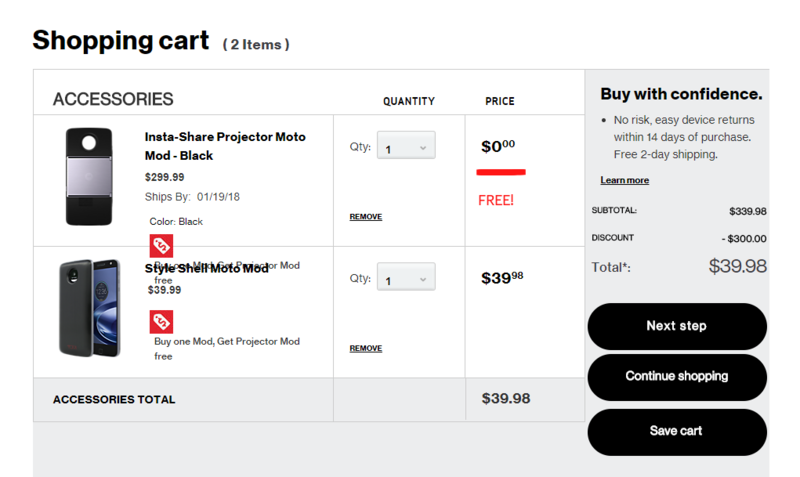 Now, at Verizon, you can get a free Insta-Share Projector Moto Mod for free when you purchase any other Moto Mod. At $300 off, it's quite the bargain. 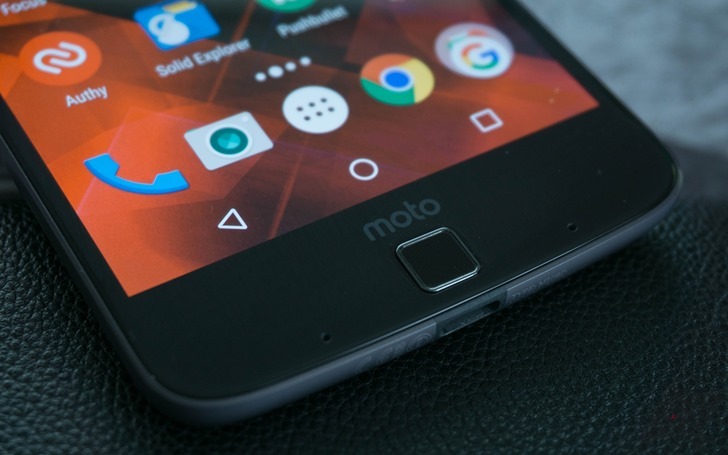 We've seen a few discounts for the original Moto Z lately. 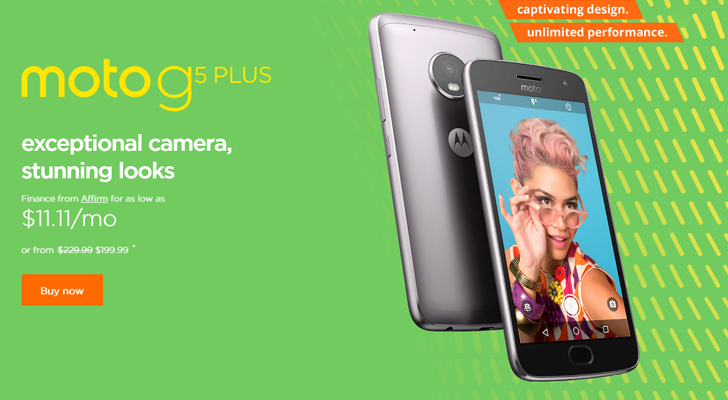 The phone was $399.99 on Amazon back in September, and Motorola currently has it for $424.99 on its online store. 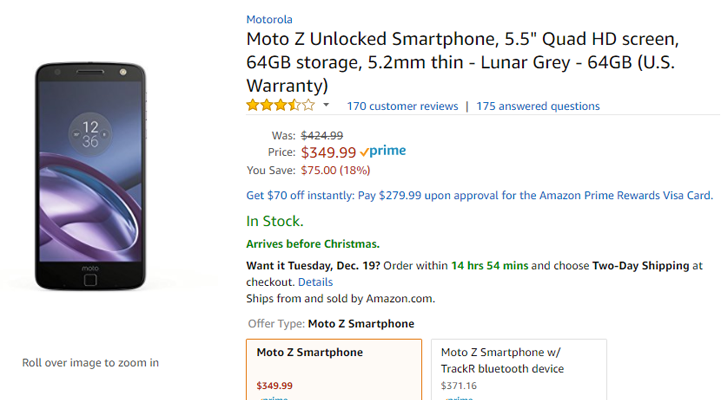 Amazon and B&H now have the Moto Z for $349.99, a savings of $350 from the original MSRP, and about $100 less than what the phone usually goes for. The mass frenzy of Black Friday/Cyber Monday sales has ended, but there are still a few deals popping up for holiday shoppers. Motorola has now discounted most of its product catalog on its online store, including the Moto Z2 Play, Moto G5 Plus, Moto X4, Moto E4 Plus, and the original Moto Z.
Motorola has struggled to come up with compelling Moto Mod accessories, and its latest attempt is a partnership with Polaroid. 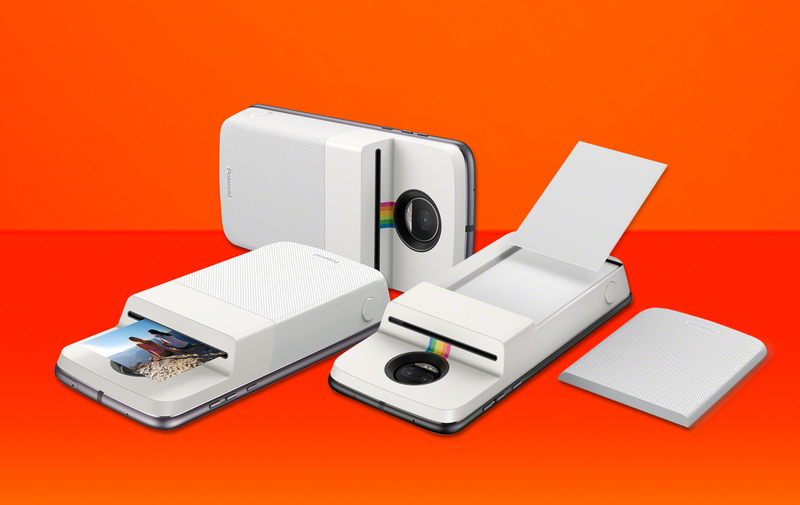 The new Insta-Share Printer Moto Mod plugs into your Moto Z device so you can print your snapshots instantly on 2x3-inch adhesive sheets. Does that sound vaguely fun? Well, you'll pay $200 for the privilege.